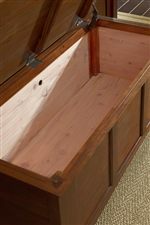 Lined with cedar on the inside to protect any clothes or blankets, this storage bench is a great addition to any bedroom, guestroom, or hallway. The large top lid can double as a seat, and has a lift top with safety latch hinges, preventing the lid from accidentally slamming shut. 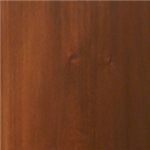 It is constructed from solid mahogany and is topped with a rich finish that will match any decor. The Westlake Transitional Cedar Lined Storage Trunk by AAmerica at Novello Home Furnishings in the Berlin, Barre, Montpelier, VT area. Product availability may vary. Contact us for the most current availability on this product. Construction Made of sustainable solid Mahogany. Create a warm and inviting feeling in your bedroom and living room with this collection. Constructed from solid mahogany, this collection combines clean lines and modern tapered legs with traditional paneling and moulding to give each piece an updated transitional style that is great for multiple decors. This group was designed with compact spaces in mind as the bed features 6 storage drawers, the dresser and chest have multi-sized compartments, and the blanket truck has a large, cedar lined interior. 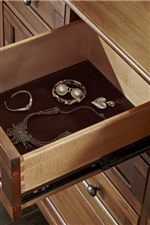 Slick features such as felt-lined top drawers and cord management make this collection convenient, while the metal knobs and sturdy construction make it durable. With occasional tables, a bed, night stand, chest, dresser, mirror, media chest, and storage trunk, you will be able to enhance the look of your entire room. The Westlake collection is a great option if you are looking for Transitional furniture in the Berlin, Barre, Montpelier, VT area. 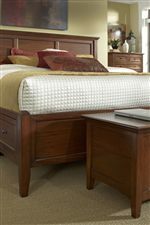 Browse other items in the Westlake collection from Novello Home Furnishings in the Berlin, Barre, Montpelier, VT area.